March 21, 2012, 3:00 p.m.: A band of army mutineers in the garrison of Kati launches an assault on Koulouba, the presidential palace overlooking Bamako. With armored vehicles, automatic weapons and rocket launchers, they target the executive residence, forcing President Amadou Toumani Touré to escape the compound with a few bodyguards and go into hiding. The mutineers take control of state radio and television, and several hours later proclaim themselves the new rulers of Mali. January 29, 2012, 5:00 a.m.: A young man is caught stealing from a residential courtyard in Bamako’s Djelibougou neighborhood. Neighborhood youths tie him up and beat him before dousing him with gasoline and setting him alight. The young man is burned to death, and his body anonymously disposed of by a local trash collection crew. The stolen goods? Two sacks of charcoal, worth no more than US$5.00 each. I’ve found reports of seven alleged criminals being killed by mobs in Bamako the first two months of 2012 alone. Surely other cases were never reported. Mob justice is nothing new in Bamako. Lynching was a common practice in the early 1990s around the time of Mali’s previous coup. Back then, there was “no law and no authority. Enraged people sought justice and wouldn’t hesitate to buy a liter of gasoline at 300 CFA francs and a box of matches at 20 francs to burn the thieves,” a Malian journalist wrote last year. Hence the practice of dousing victims in gasoline and settling them ablaze was nicknamed “Article 320” of the constitution. I don’t believe it’s a coincidence that the recent coup d’état in Bamako followed several months of lynching incidents. The coup and vigilante justice are different expressions of a single logic shaped by the state’s perceived failure to enforce the law. When the government is seen as having abdicated its fundamental responsibilities, by this logic, taking charge through violence becomes legitimate and even salutary. Two points are key here. One, this logic is neither universal nor uncontested. There are many Bamakois opposed to the coup, just as there are many opposed to lynching. If you scan readers’ comments on the news links above, you’ll find some condemning mob justice and others expressing support for it. Two, whatever the actual motivations of the coup leaders — and, as I’ve pointed out, their public justifications have been all over the map — part of the junta’s appeal to Malians in general, and Bamakois in particular, has been its stated intention to end the lawlessness prevailing in Malian society, in affairs of state as much as in everyday life. 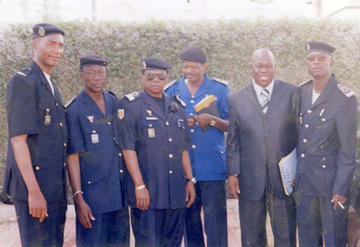 Malian police: Would you trust these men? It’s telling that the Badalabougou youth I mentioned earlier ended their march at a police station. They were serving notice that the state had failed in its duty to protect law-abiding citizens. Consider also that in some of the incidents detailed above, mobs confronted law enforcement personnel who had suspects already in custody. What the recent wave of lynching suggests is that by late 2011, a large number of people here had lost all faith in their justice system’s ability — and even willingness — to punish wrongdoers. This mistrust extended to many areas of government. When people no longer trust the institutions of the state to protect their safety or defend their interests, such responses become foreseeable. Bamako’s recrudescence of lynching in mid-2011 should have been a warning sign in this regard, an indication that the regime was in trouble. I wonder whether political scientists studying cross-national data might be able to find a correlation between instances of mob justice and violent internal regime change. The problem, of course, is that vigilante justice goes too far. When it does not punish the innocent, it metes out disproportionate punishment. With no oversight and no limits, vigilante justice quickly goes awry. The same is true of military juntas and any other regimes improvising their way in the absence of institutional controls, checks and balances. You cannot rebuild the rule of law through extralegal means. Unfortunately, this is a lesson that not enough people have learned, and I think the cost to Mali will be much greater than that of two sacks of charcoal. Update, May 10: Here’s a recent article on the “reappearance of Article 320” in Bamako’s Commune I.
Update, August 26 2013: An item on the killing of a 20-year-old suspected motorcycle thief in Bamako’s Boulkassoumbougou neighborhood. This entry was posted in Uncategorized and tagged cnrdre, coup, vigilantism. Bookmark the permalink. I am Ghanaian who lives in Bamako. I do absolutely agree with your analysis that vigilante justice increases in proportion with a breakdown in the established systems of law and order, and also with the perception by the public that the law-enforcement agencies are failing/have failed to protect the citizenry. This has been evidenced in Gnana, and unfortunately, there have been innocent victims. I hope and pray that Mali does not go down that road as well. Charis, what do you think the prevalence (or lack thereof) of lynching in Ghana suggests about democracy and the rule of law there? I haven’t lived in Ghana in a few years so I don’t know if things have improved in this respect. I do know though that the rise in mob justice began at a period when the public started to lose faith in the police, and the law enforcement structures. I guess some may see it as the downside of democracy, that known criminals are let off the hook in the name of serving democracy and ‘human rights’, while the victims of crime suffer and lick their wounds silently. The public beatings of “thieves” in the market still sticks in my mind as one of the most frightening things that I saw in Mali. Good comment about relevance to the political situation. It would be an interesting study to see if activities like this are “leading” indicators of looming instability. I remember cases of accused “zonw” (thieves) being beaten in marketplaces when I was a PCV in the late 1990s as well. But I don’t remember hearing about the victims being burned to death during that period. Ah, those were the days…. Being there in the earlier period that you mentioned, I heard of “loi 320”, especially at the Grand Marche in Bamako. We were cautioned about going to the market at that time period. Thankfully, I never witnessed “loi 320”. Thanks Bruce for your excellent coverage of the situation in Mali. Do you have a sense as to whether the Junta is widely accepted or backed by ranking officials within the Mailan military and is there any risk of a civil war between military factions? Also, any word on how the regional governments in Mali are functioning at this time and where their preferences may lie? The second thing, as you point out, is that the last big moment of “bisaaba ani duuru” or “Art. 320” (why the different sums, I have always wondered?) is the 1990s… following Moussa… and it took years to more or less put an end to the practice, at least in Bamako. However, even if burning people alive became less common, vigiliante justice has always been present, no? Thanks so much for keeping these insights coming. They are invaluable. I made some notes at the time of the early 2011 necklacing incidents as reported in the Malian press, but I was rather looking at it from the point of view of Bamako’s galloping urbanization, as well as the after effect of everyone buying those inexpensive “jakarta” motorbikes over the last 5 years. Seems like there are periodic scares from many cities in the sub-region over waves of jakarta thievery. The 2010 road banditry epidemic north of Agadez was first reported in the press as a wave of motorbike thefts, and there was late last year a reported spike in such thefts in Kidal that some said presaged very bad things. In Niamey, after the 18 February 2010 coup, one of the most popular things the interim governor did was first indiscriminately arrest all the young men who hung around parks at night, and then organize residents into periodic street cleaning events, called “Niamey Nyala” or “Niamey propre”. The elected civilian government has continued these cleaning holidays, but I don’t know how effective they’ve been. Also, Jean-Jacques Mandel has an interesting article on sorcery panic/rumors in 1997 Bamako which both discusses “l’article 320” and how anxiety over armed conflict, perceived economic injustice, and state corruption sparked panics. I love that Mandel article — I cited it in my book! As for the Jakarta, that’s definitely made a difference, first by providing something easy to steal and resell, secondly by having its own ready supply of gasoline at hand (now the mobs don’t even need to go to the station to buy some). Correction: Niamey Nyala is now a much larger — paid urban development — program by the current government.